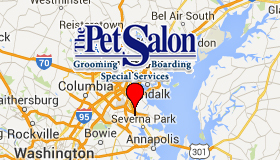 Surrounded by nearly 5 wooded acres, The Pet Salon is conveniently located in Millersville, MD and we specialize in Pet Boarding in Anne Arundel County. Since 1971 when we first opened our doors, we have earned a reputation for excellence in caring for the needs of our clients’ pets with plenty of tender loving care. Being located in Anne Arundel County, we are convenient to Severna Park, Riveria Beach, The Naval Academy, Mayo, Edgewater, Annapolis, Glen Burnie and Pasadena. 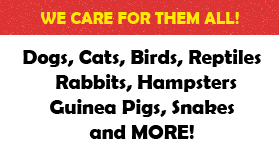 We offer convenient and comfortable pet boarding services for cats, dogs, reptiles, rabbits, rodents and more. Check out our main pet boarding pages for rates and specific information. 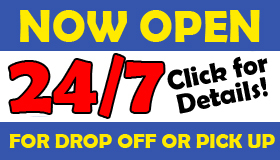 Now offering 24/7 pickup and dropoff. Pet grooming services include bathing, nail trimming, ear cleaning / plucking, trimming, shaving, etc. Visit our pet grooming page for more details on rates and services. Pet care, or dog playcare as we call it, is a great way to keep your pet occupied while you’re away. No need to worry about crating your dog all day or wonder what they’re chewing on now! We also offer pet shipping services through our partner, Animailers. We can help you with pet relocation services by air or ground transportation, domestically or overseas. Need a crate just for a few days but don’t want to buy one? Need a crate for a visiting pet? Give us a call for information on crate availability and rental rates. Call us today at 410-647-3505 with questions or to schedule pet boarding, pet grooming or a stay in our dog playcare.